Crater Lake National Park is a gem of the Pacific Northwest. It is located in south-central Oregon in a sparsely populated area and it truly is in the middle of nowhere. That’s what makes visiting Crater Lake all the more an adventure. You are not going to get to Crater Lake unless you make it your purpose to get here. The closest airports are in Klamath Falls (60 miles from the park) and Medford (80 miles from the park). But getting there is well worth your effort! 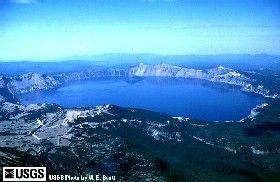 Few places on earth create such an overwhelming awe from observers, however, Crater Lake National Park certainly does. Even in a region that boasts many natural and volcanic vistas, the only description for Crater Lake is incredible. You may have heard about the deep blue color of the lake, but words can never prepare you for the first breathtaking look from the edge of this 6-mile wide crater or caldera which was caused by the eruption and subsequent cave-in of Mt. Mazama a few thousand years ago. My most vivid memory of Crater Lake is finding various overlooks along Rim Road that encircles the park. One spot, in particular, has an incredible overlook that you can walk out on that isn’t much wider than 3 or 4 feet. The thing that makes this spot so awesome is that the 3-foot wide path out to the overlook drops off steeply more than 1,200′ in some places. Sorry I won’t tell you where this secret spot is, I’m going to let you find it all on your own. However, you will certainly know it when you get there! Much of the year Crater Lake is snowed in. The area around Crater Lake receives some of the heaviest snowfall in the country, averaging an astonishing 533 inches per year. For a brief time each year, Crater Lake National Park emerges from this winter freeze to bask in the summertime sun. If you visit early in the season you may be surprised by the amount of snow which remains long into months which are considered early to mid-summer in most parts of the nation. Because of these harsh and often unpredictable weather patterns, most park roads are closed even through the late spring. Crater Lake is host to a vast array of activities. While enjoying the natural scenic wonders, park visitors may hike in old growth forests, participate in a variety of interpretive activities, camp out or stay in a historic hotel, or even cross-country ski during the very long eight-month winters which are experienced here in the Cascade mountains. 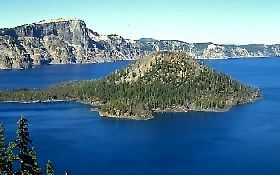 If you are planning to visit Crater Lake there are only two campgrounds in the park that have a total of 216 tent sites. Spaces are available on a first come first serve basis as reservations are not taken in the park. If you love the outdoors and are especially fond of our nation’s National Parks, you don’t want to miss the incredible beauty that awaits you in Crater Lake National Park. About the Author: Alan LeStourgeon operates a vacation rental website where you can find comfortable cabin rentals, recreational and hiking vacation information and information about log cabin furniture.